Can Virgo men and Scorpio women relationships be compatible mentally, emotionally and sexually? The Virgo Man Scorpio Woman relationship has the potential to become a very passionate love match. Are they true soulmates? Where the Scorpio Woman is very mysterious, the Virgo Man can be very shy. The friendship might start off slow but the Scorpio zodiac sign is able to bring a world of passion to the Virgo and open him up to new ways of thinking. The Virgo Man will first fall in love with a woman’s mind before he can start to appreciate her beauty or social skills. The Scorpio Woman is very creative and imaginative which will spark great conversations with the Virgin. He will find her mysterious side very interesting and will want to discover who she really is. In turn, the Scorpio female will want to break down the walls of the Virgo male who can be very shy. They will see in each other the potential for a greater relationship. The Scorpio lady can be very possessive. She will never get jealous of the Virgo guy who is reserved and not much for the big social scenes. She is able to provide safety and comfort for her Virgo mate who is looking for stability. He just and wants to know that his woman is faithful till the end. The Virgo man Scorpio Woman in love can build that reassurance thus creating a harmonized living environment. The Virgo Man is capable of delivering some harsh criticism. He is able to see the small details in everything, which makes him perfect for discovering the mysterious ways of the Scorpio Woman. Thankfully she will appreciate the his feedback and won’t be upset when he shares his thoughts with her. The Scorpio Woman is very responsible and will be able to have the same financial stability as her partner. These two zodiac signs will never have to worry about money or who will be making the most in the relationship. She has great confidence which he often lacks in this field. When he starts to worry, most likely about what is going on in his work life, she will be able to relax him and bring clarity to his mind. Scorpio Women are known for being visionaries and can spark new ideas with their lovers. Her creativity can often lead to most of the solutions when conflict arises between them. There will be fireworks in the Virgo Man Scorpio Woman marriage when it comes to the activities in the bedroom. In bed, The Scorpio woman likes to dominate and will show the Virgo Man a world of love and passion. She is capable of showing the Virgo a new side of love, sexuality and love making and her creative side will always keep things interesting and new. It’s a good thing the Scorpion is very patient because it might take the Virgo Man some time to come out of his shell in this aspect of the relationship. The Scorpio Woman has the tendency to be a little temperamental. Her mysterious ways can often mislead the Virgo Man and he might be surprised when conflict does appear between them. Virgo Men are very rational so they are open minded to compromises so it won’t be likely that conflict will remain between these two for long. A Virgo Scorpio breakup does not happen so easily. Virgo is an earth sign that is mutable and Scorpio is a water sign that is fixed by nature. 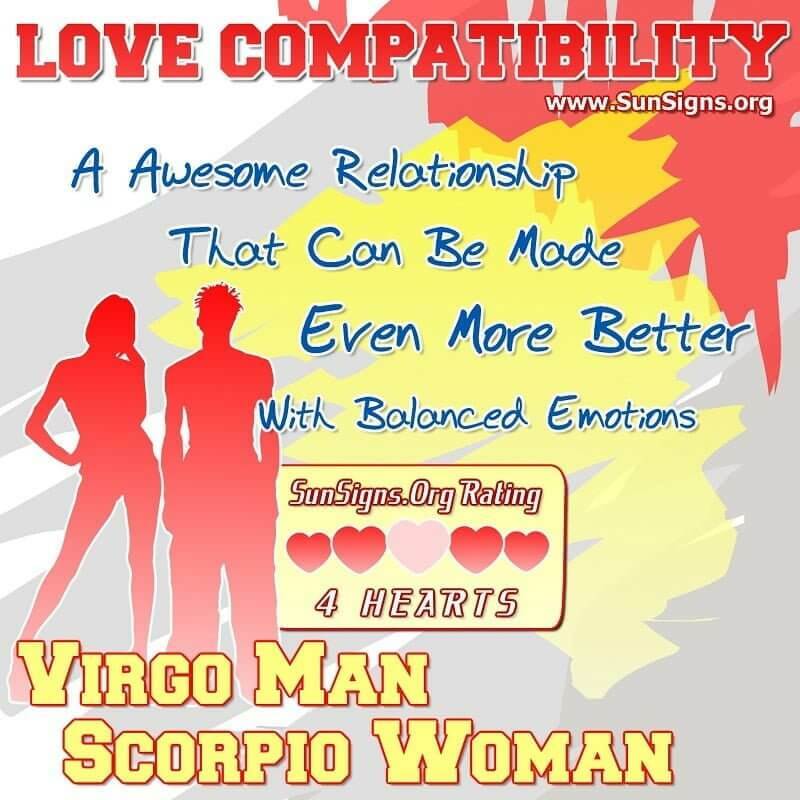 The Virgo man Scorpio woman compatibility gets a FOUR Hearts love rating. The Virgo Scorpio couple bring balance to each other’s life and the stability that they both look for. The Virgo Man and Scorpio Woman love compatibility appears to have the best potential out of all the other Zodiac combinations. There will be plenty of love and passion while these two enjoy each other’s time together even while they are dating. They both possess the same level of intellectual thinking while the Virgo Man is more analytically and the Scorpio Woman is more creative. As long as the Virgo and Scorpio remain patient with each other, there days will be spent in a passionate loving embrace.